As the new Artistic Director of the Lyceum Theatre in Edinburgh, David Greig has begun his stint in this role by creating a new version of an ancient Greek play. Written 2500 years ago by Aeschylus, it is one of the world's oldest plays and yet the subject is chillingly contemporary. In fact many of the lines from the original play (which I recently wrote about here) fit perfectly in describing our world today. On a crisp autumnal night in October we made our way through from Glasgow to the Athens of the North to see The Suppliant Women. Aeschylus' play is the first part of a tetralogy telling the story of The Danaids, a tale well known to the audiences of Athens that first saw it performed in around 470BCE. The Suppliant Women is the only surviving part of Aeschylus' Danaid Tetralogy. It tells of the 50 daughters of Danaus, fleeing across the sea from near Syria, escaping from forced marriage to their cousins, the sons of Aegyptus. They land in Greece at Argos and seek asylum. Although they may look foreign, they tell the people there of how they are descendants of the Argive heifer goddess Io, basically "we're all Jock Tamson's bairns". The play was first performed in the theatre of Dionysos in Athens, where the wealthy sponsors of the plays would carry out a libation before it began. This is a tradition which has been resurrected for The Suppliant Women, with different MPs and MSPs this week having performed the libation each night on stage at the opening of the play. We were told where the funding for our play came from, and the gods are offered an offering of wine (Dionysos was not just the god of theatre). It is a smart reminder of where the funding for theatre such as this comes from (largely the people, the demos, as it turns out). In that respect they are missing a trick in fully achieving the 30p in each £10 funding provided from the theatre bar by running it as a 90 minute piece with no interval, as I missed the chance to chip in an extra £4 for a wee tub of ice cream. We are asked to see if we can see anything of our current times reflected in the mirror of this old piece of theatre. With ancient paintings of theatre performances and Aeschylus' words themselves really all we have now to go on, what did ancient Greek theatre actually look and sound like? When you look at the scale of the theatre of Epidavros, despite its famous acoustics, it is hard not to imagine that music and a raised chorus of voices would be required to lift the sound to the cheap seats at the back. The Suppliant Women is unusual because the chorus here plays a large part in the story as a character. In David Greig's telling of the story they set the mood from the moment they stride on stage, rhythmically beating out the metre with their feet. The stage is stripped back and open. The play is set in ancient times. The modern, casual dress of the chorus keeps us in the present. The chorus themselves is made up of local volunteers with professional actors Gemma May, Omar Ebrahim and Oscar Batterham taking the lead parts. The chorus though, the suppliant women themselves, are a fantastically well choreographed, ebbing and flow, huddling and scattering ensemble. The fact that the asylum seekers are here drawn from our local community emphasises the feeling that they are our kin. Written by David Greig, directed by Ramin Gray and with music composed by John Browne, the team behind The Suppliant Women have already worked together successfully with The Events. When that play toured it triumphantly used local choirs on stage as part of the piece, and with the Suppliant Women again local people will be used. The chorus in Edinburgh will be replaced by people of Belfast and Liverpool when the play moves on. The rhythm that started with the marching feet carries on through the play in the pulse of the language and John Browne's music, played by two musicians. I am no expert of ancient music but it feels and sounds true, equally Eastern and at times like a mournful Celtic keening. 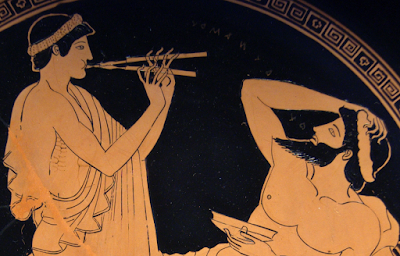 Particular credit must go to the Aulos player whose playing was very evocative. When the women are met by King Pelasgus of Argos (Oscar Batterham) he is suspicious of these foreigners and the troubles that they might bring. Sharply dressed and with a politicians measured assessment he decides to put it to the people of Argos to decide - the word democracy is first found in Aeschylus' writing. It falls to a man, their father to make their case in the city, whilst the women still fearing violence against them from men stay in the safety of the holy temple they have come to. Their father warns them that people will fear them, they should "always be modest", "defer" to people, keep your head down and don't cause trouble. Only this week the people of Hungary were asked to vote in a referendum on whether asylum seekers should be allowed into their country. Whilst 98% of Hungarians who voted stated that they would not allow refugees entry to their country, most people in the country managed to scupper the vote by not participating. I don't need to labour the point that the words from 2500 years ago seem again and again to echo to our times. Even when the people of Argos vote overwhelmingly to welcome these people in need (and more than that, to fight to defend them if required) dark clouds (or sails) are on the horizon and the men from their homeland arrive to drag them back by force. The older women of Argos welcome the women, but with the coda that they should not scorn Aphrodite but welcome men and lust as that is the way of things. The suppliant women display a more independent streak, as they leave the stage with their exiting ode (Exodus). In a week where Theresa May's Conservative party asks employers to report foreign workers, overseas doctors are being told they are no longer welcome and there will be a crackdown on overseas students and visas, it is clear that Danaus' warning to his daughters that people fear foreigners is as resonant today as it was for the original audiences. The people of Argos are shown to have done the right thing in the play, aware of the potential consequences. We clearly still need taught this lesson. On top of the language, words like drama, democracy and exodus that came from the Ancient Greeks, I am astounded at the modern parallels being found in the stories of ancient plays of Aeschylus. Recently the three plays of The Orestiae was retold (as This Restless House) by the Citizen's Theatre. Working with a smaller fragment of source material The Suppliant Woman packs a mighty punch. It is also the nearest that I have been to encountering what the ancient Athenians maybe saw. Stripped of marble columns and chiffony robes, the words are allowed to sing out. If the aim of David Greig's time at the Lyceum is to bring poetry and community into the theatre, he is off to a flying start. I would really encourage you to go and get a ticket for this if you get the chance. As it is national poetry day today, I will finish with a short poem from a modern Greek poet and playwright - Stamatis Polenakis, called Elegy. stops the perpetual motion of the world. in the perpetual motion of the world."